Ty Gwyn in Cei Bach, near New Quay, Cardigan and Ceredigion sleeps 6 people. Ty Gwyn near New Quay is a charming, detached property which offers comfortable and spacious accommodation, and is perfect for year round holidays with its cosy wood burner, perfect for winter escapes, as well as a delightful sun room opening out onto lawned gardens, perfect for family summer seaside breaks. 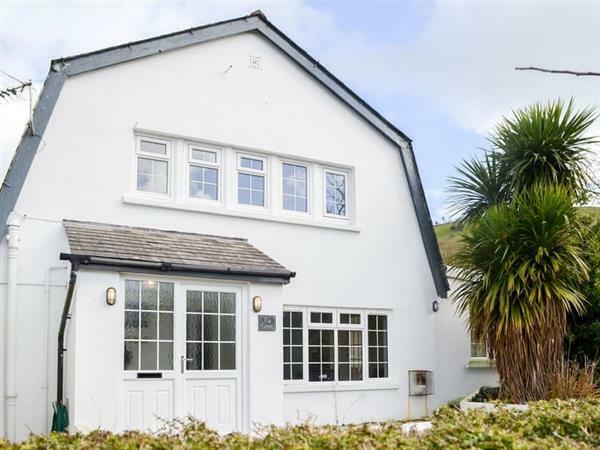 Ty Gwyn enjoys a superb location just a short stroll from a sheltered sandy beach and close to the quaint Victorian seaside fishing town of New Quay, with its good selection of cafés, pubs and restaurants. A must for every visitor is a boat trip from the harbour round the bay for a closer encounter with the seals and dolphins that this area is famous for. This idyllic area affords excellent walking and lovely beaches, with many visitor attractions within easy reach including a honey farm, the pretty Georgian town of Aberaeron and the quaint resorts of Aberporth and Llangrannog. The ancient town of Cardigan to the south and the Victorian resort of Aberystwyth are also close by. The beach is only 300 yards from Ty Gwyn near New Quay. With the shop, pub and restaurant being 2 miles from Ty Gwyn. Living area: With wood burner and 32 Smart TV. Gas central heating, electricity, bed linen, towels and Wi-Fi included. Initial logs for wood burner included. Travel cot and highchair. Enclosed lawned garden with patio and garden furniture. Private parking for 2 cars. No smoking. Holidays at Ty Gwyn run from Friday to Friday. Pets allowed at Ty Gwyn. For a better idea of where Ty Gwyn is, you can see Ty Gwyn on the map below. Ty Gwyn is in Dyfed; should you be on the lookout for a special offer, you can find all the special offers in Dyfed. It's always worth checking to see what is on offer at the moment. Do you want to holiday near Ty Gwyn (UK10663), you can see other cottages within 25 miles of Ty Gwyn; have a look to find your perfect holiday location.